Newark, NJ has one of the highest crime rates in the country. In regards to homes and businesses, one in 42 properties will incur a crime, including burglary, theft, or damage. Furthermore, 383 crimes occur per square mile in Newark annually. What does this mean for you and your family? 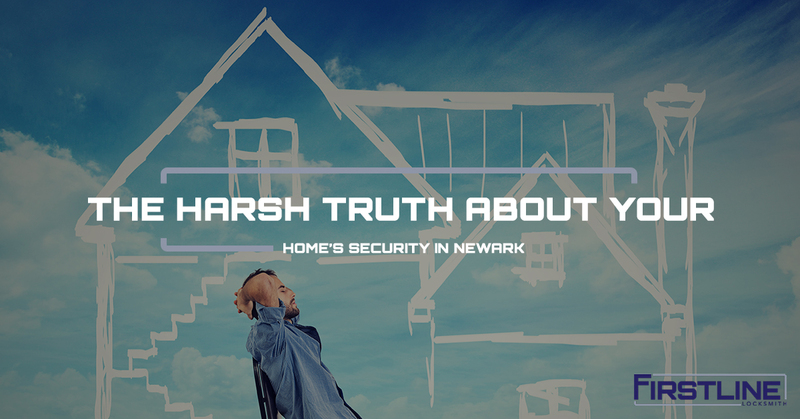 The truth is you need to upgrade your home security to increase safety. It may be hard to stomach, but it’s up to you to do everything you can to keep your loved ones safe. In this post, we’ll share some professional locksmith advice on how to improve your home security. If you read this post and feel as though you need help implementing the advice, give Firstline Locksmith a call today! We’re a full-service locksmith company, including residential, commercial, and auto. Otherwise, continue reading to learn what you can do to enhance the security of your home and keep your family safe. It’s not enough to have a single deadbolt on your door. You’ll want to install a solid core or metal door to deter breaking through it during a crime. Furthermore, upgrading your deadbolt and knob locks to high-security, heavy-duty components will increase security even more. If you decide to stay with a wooden door, install a four-screw strike plate to improve resistance to blunt force break-ins. Finally, add a wide-angle peephole to all your exterior doors to give you the ability to see outside without actually opening the doors. As one of the weakest security points on a home, the windows are highly susceptible targets for criminals. In most cases, windows can be found on the first level of the home, hidden from sight, and are relatively easy to break into. You’ll want to add blocking features, limited open-range components, anti-lift devices, alarm decals/stickers, high security latches/locks, and anti-burglar glass. If you’ve gone and upgraded your doors and windows, but you want more security for your home, consider an advanced security system. You’ll find that motion-sensor lights, cameras, and alarms all work to deter criminals from targeting your home, and if they still choose to break into your home, you will have a better chance of capturing their identity, or some other vital information, to report to the police. Furthermore, criminals target homes that look easy to break into, so if you do your due diligence with the advice from above, you will greatly increase your home security and decrease the chance that a criminal will target your home. Firstline Locksmith has been serving Newark and the rest of New Jersey for more than 25 years. We take home security and the safety of families seriously. As the premiere locksmith company in the state, we’re dedicated to delivering top-tier locksmith workmanship alongside unprecedented customer service. Call us today to get started on your home security upgrades!